Here at the Langstone Cliff Hotel, one of the most child friendly wedding venues Devon has to offer; we know it can be tricky making sure that all of your guests- right down to the littlest ones- are kept happy on your big day. To make life a little easier, we’ve put together a few handy suggestions to make sure that your wedding by the sea is as inclusive as possible. While a small rustic posy of meadow flowers secured with a beautifully calligraphed recycled paper luggage tag might excite your adult guests, your smaller invitees might not be so thrilled. Instead, how about a personalised colouring-in mat of the bride and groom? Or, for the more committed wedding planner, a treasure hunt for the little ones? You could provide a small basket for collecting goodies and a list of clues along with their place setting. Collecting little sweeties or small toys will keep the kids busy while you sip on your bubbly! When deciding on your wedding menu, remember to make it child friendly. This either means making all of your food suitable for everyone, or having separate options for the tots. One good option to make sure that everyone has something they like is providing sharing platters or a buffet; this way there is something for everyone. Alternatively, providing simple meals like sausage and mash or pasta will make an easy and cost effective addition to your menu. A kids only area at the reception is a good way to keep the little ones entertained. Setting up ‘No Grown-Ups Allowed’ area filled with toys and games in a quiet corner of the reception is nice way to keep children occupied without them feeling banished. A tepee strung with fairy lights and bunting is an option that both looks pretty and will enchant the children. Much like the aforementioned place settings, you’ve got to make sure the wedding favours appeal to little ones too! Sweets are always a good option, but consider providing natural fruit based sweets instead of artificial sugar loaded ones to avoid a crazy sugar high (their parents will thank you). You could also include small toys, something crafty, personalised iced biscuits (although these could be for the big kids too), or cute little dressing up items like masks and ears always go down well. All the fun of the fair can tire out a tiny wedding goer! 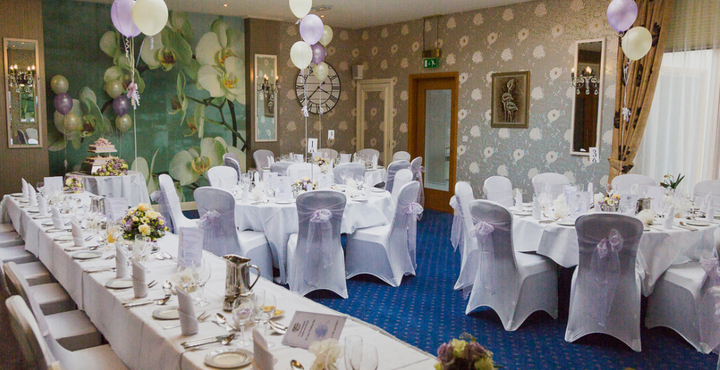 Making sure you have your wedding in a venue which has child friendly rooms is a great idea as this means the little ones can be put to bed with a baby monitor, and mum and dad can keep on partying downstairs! As one of the best family friendly places to get married in Devon, Langstone Cliff would be delighted to host your child friendly wedding, just give us a call on 01626 868 000 or contact us to start planning your perfect day!